Pam’s tremendous love of nature and the beauty and wonder of the world around her was fostered at a very young age. Coming from a very artistic family, Pam was surrounded by art and craft supplies lending themselves to constant creativity. Raised in the town of Aurora, Illinois. Pam and her husband Steve moved to Cora, Wyoming in 2005. Pamela began oil painting officially when taking a class with her then 8-year-old daughter, Stephanee. It was a mom and child “make and take it class” at the local college. The first oil painting was of a wolf lying in the snow. The painting brought out such exuberance and joy in finding a talent she didn’t know she had. Pam studied under this same local artist for many years. Pam then went on to use not only oils but other mediums such as acrylics and alcohol inks. 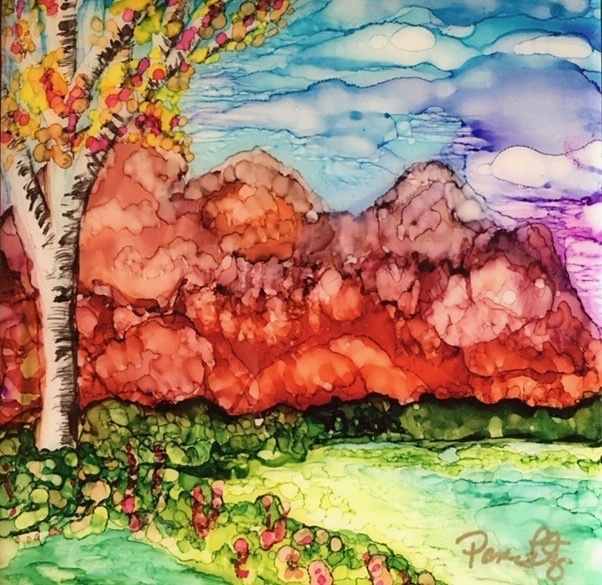 Once a very realist and structured oil painter Pam has found such joy and freedom in abstract alcohol ink painting. Her paintings burst with contrasting and harmonious bold colors bringing life to her compositions. Pam’s distinctive personal but style emanates joy, peace and expresses her vibrant spirit. Pam’s tiles are not only wall or table art, but she also paints useful items such as coasters, trivets, and cups. She believes you can create anything once you see it in your mind.